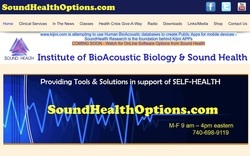 This is the home site of cutting-edge BioAcoustics research. Most of the links below are from here, but have shortened URLs for easy to remember direct access. These videos illustrate the basic concepts and steps to perform a vocal analysis. Download the personality profiler here or try the online portal version. 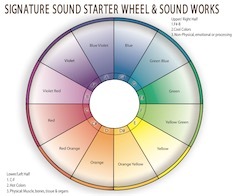 The colors associated with a person's dominant notes can provide insight. 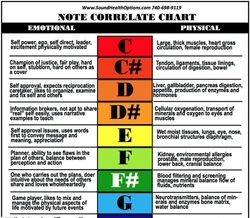 This chart lists the emotional and physical associations of the notes. 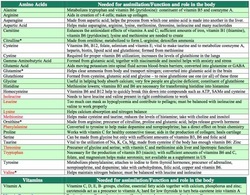 This is a table of nutrient functions and roles. If a vocal analysis report indicates the frequency equivalent of a nutrient is high, check here to see what co-nutrient may be needed for assimilation. Reference site shows physiological functions associated with the various spinal vertebrae. 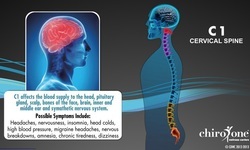 The spine and nerve system are interrelated and connected to every aspect of health and wellness. This animated interactive 3D spine simulator tool shows the organs and nerves affected by selected vertebrae. Click the organ to reveal more detail, including tips for driving, sitting, sleeping, and standing. 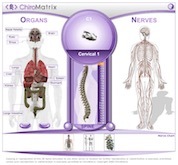 This reference site interactively shows the functions of the body's main physiological systems. 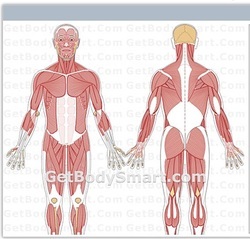 Here's a shortcut to the muscular system. Myofacial trigger points are hypersensitive areas that contract a muscle, referring pain elsewhere in the body. It may be helpful to treat both the trigger point and the affected areas. 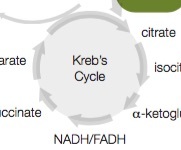 This diagram illustrates the five cycles that make up the methylation pathway. To learn more about how this can be used as a roadmap to understand the interaction of genes, nutrients, and cofactors for ideal health, see this, that, and over here. When a vocal print indicates an imbalance, you could promote balance with color, sound, or nutrition. While not as precise as the lab equipment capable of producing analog frequencies accurate to four decimal places, you could listen to music in the appropriate key. If the NanoVoice chart shows too much of one note, check the note six spaces apart; if too low, listen to music in that key. Here is an online database of music by key (shown after the slash). Here are lists of Classical and Easy Listening music and their key. You could also use NanoVoice as a realtime biofeedback tool, adjusting your voice to force the missing notes to be filled up. IBIS is an encyclopedic Macintosh/Windows app of professional caliber, containing a vast compilation of health conditions and associated therapies such as nutrition, botanical medicine, acupuncture, homeopathy, sound, and more. 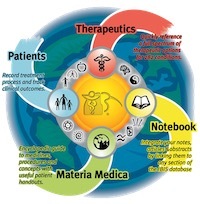 Written with the professional clinician in mind, IBIS is just as accessible and immediately useful to anyone in education, the healthcare field or natural products industry. Why try to sort out thousands of references and an endless variety of treatment possibilities when it's already been done... and time-tested by thousands of users for almost twenty years? Now free!